Sometime near midnight, the two-lane highway in the middle of Wyoming is shrouded in a ghostly dark. Four of us are traveling in a pair of import pick-ups loaded with winter clothing, medical supplies, non-perishable food, sleeping bags, tarps and more. Standing Rock, North Dakota looms like a mythical destination still roughly 12 hours away. In the distance, a field of tiny red lights flash on and off in rhythmic synchronization with each set of lights arranged along a vertical axis. I imagine they are radio antennas at first. When our route brings us closer to the low rolling hills where they stand, it dawns on me, finally, that they are beacons affixed to the upright columns which support an armada of wind turbines. Maybe they twinkle with a regularity that says there is enough winter wind in these wide-open Wyoming prairies to generate a steady flow of electricity. Or perhaps they are simply meant to alert any low-flying aircraft that should happen by. Aura Vásquez, a Columbian-born, L.A.-based social justice and environmental activist, has organized a two-vehicle caravan to deliver provisions to the water protectors and their allies who have set up various camps at the Standing Rock Sioux Reservation in solidarity. People from throughout the world have assembled to voice their peaceful and prayerful opposition to the Dakota Access Pipeline slated for construction nearby on disputed treaty land. Energy Transfer Partners plans to put the pipeline in the ground underneath the Cannon Ball River. Aura now rotates pilot duty at the steering wheel of the lead vehicle, a late model Nissan Tacoma with Armando Telles, a young-ish U.S. military veteran recently returned from a tour of duty in the Middle East. I’m driving a Tundra, the more expansive and sportier upgrade from the same Japanese automaker. Behind me, the truck’s owner, also named Armando, is asleep in the wide and comfortable back seat. I’m still euphoric after a brief pause a few moments before, during which we’d parked both pick-ups, switched off the headlights and braved the below-freezing temperatures for a look at the sky. At Aura’s suggestion, the three of us who are awake lie down face up, side-by-side across the highway lane divider to gaze up at a heaven so swollen with stars that I understand why our galaxy is called the Milky Way. It is magnificent, and it takes my breath away. The creamy, almost fog-like concentration of distant suns reminds me of a milk splash, a faint, light-encrusted vapor. Earlier, before sundown, we’d driven into a sudden snow flurry. A well-intended attempt at fitting the lead truck, at Aura’s suggestion, with snow chains was ultimately misguided. A dinner break not long after sundown had revealed tensions that were partly the result of frazzled nerves and road weariness but also related to our stubborn unwillingness, as men, to follow instructions or take directions from a strong woman. We hadn’t made the kind of time I would have liked because the three daily meal stops turned into long, laid-back affairs. I was concerned because I had promised my unseen spirit guides that, in exchange for the opportunity to travel as part of the caravan, I would make a concerted effort to avoid any danger or risks that might require yet another one of those intercessions that had marked my wayward journey through life as a devil-may-care adventurer. Simply put, my guardians deserved a vacation. The irony of the harvest season holiday only a day in front of us fueled my need to be with the Lakota people and the water protectors precisely when most folks in this country would be gathered in their homes for the traditional turkey and dressing facade. 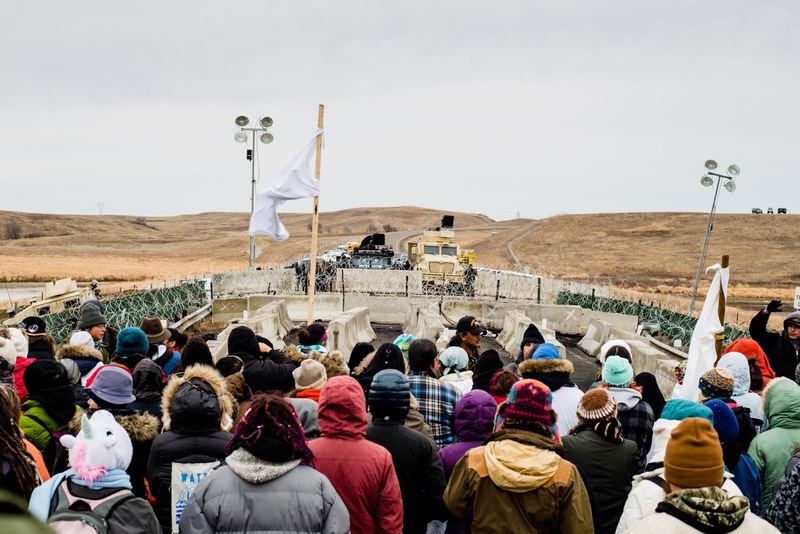 To me, the Dakota Access Pipeline represented the epitome of a Thanks-taking take on what has been traditionally regarded as a celebration of gratitude. In my humble estimation, it seems untoward and almost repugnant for descendants of the Mayflower immigrants—who were escaping persecution like many of the Syrian refugees seeking safe harbor on our shores today—to celebrate the Plymouth Rock pilgrims when the descendants of those who helped them survive a bleak winter are being shot with water cannons and rubber bullets at the hands of law enforcement officials and private security goons. And the military grade, Blackwater mercenary-style, anti-insurgency suppression tactics augmented by psy-ops warfare strategy deployed by a for-profit corporate oil concern on U.S. soil against unarmed citizens and members of sovereign tribal nations engaged in lawful, constitutionally protected peaceful protest as well as traditional prayer ceremony has already taken on the dimensions of travesty. I see it as a putrid stain on the offending oil company’s reputation as well as on the records of the legitimate law enforcement officers who have colluded with the freebooter fascist security operatives paid to ignore Geneva Convention human rights protocols and treat original Americans with callow cruelty. During an unexpected call from a friend who’s just walked away from an L.A. freeway accident that's totaled his car, the cell signal falters. Resting the phone on the seat between my knees, I look up and notice that the red taillights I’ve been following for hours are barely visible in the distance. Although highway signs have warned us to watch for black ice, I’ve never had any personal experience with it and don’t really understand how dangerous it can be. Observing a discoloration on the surface of the asphalt up ahead, I nonetheless begin accelerating to catch up. I hear a hollow thump sound and know automatically that we’ve lost contact with the surface of the road and are literally speed-skating across an ice patch. I take my foot off the gas and loosen my grip on the steering wheel in what seems like slow motion. The Tundra whips into a 360-degree spin even as it drifts quickly toward the right edge of the northbound lane we’ve been driving in. Mando Valdez, whose truck I'm driving, comes to in mid-spin seconds before we careen over the gravel embankment and head nose first down a steep, foreboding slope. In the dark, through the left driver’s side window, I see a huge plume of snow go up like a tidal wave as we fly off the roadway. We come to halt at the bottom of the incline. I’m still in shock and bracing for an impact that will surely flip the truck over. Mando is seething, the icy anger in his throat undeniable. I’ve just nearly killed us both. “Stop. Don’t touch anything. Okay?! I need you to take the keys out of the ignition,” he hisses from the back seat. “Now, open the door. Get out of the truck and walk around. Tell me what you see. Are the lights still on?” Underneath the front end of the Tundra, I see a lightly packed snow drift that appears to be about a foot deep. Fortunately, the snow has served as a brake and a buffer, ending the dizzy circular motion that has driven us off the roadway. It has also cushioned our descent and prevented any damage. Mando begins breathing easier and assumes a natural command over the scene. He takes the wheel and, much to our relief, the engine fires up readily. He climbs out, searches through the bed and hands me a small camp shovel so I can begin digging the snow out from under and behind all four tires. After about an hour-and-a-half, long enough for my thick snow pants, my socks and the insides of my hiking boots to become soaked by the melting snow, there is enough muddy earth visible behind the front tires for us to lay snow chains flat on the ground and extend them upward along the incline. The weight of the engine works in our favor as Mando pops the truck into reverse and eases it backward onto the roadway. I pick up scattered bunches of the sage we’re bringing to the Standing Rock Lakota Sioux as an offering. The box in which it rested is the only thing that’s flown out of the cargo we’re delivering. We recover all of it. Mando announces that no one else will drive his Nissan in either direction. Two hours later, he is spent and understandably unwilling to relinquish the wheel. He pulls into a gas station where Aura and Armando have already parked. They announce that they will drive on to the reservation and invite me to join them. I politely decline. Shame and regret compel me finish out the trip with Valdez with whom, it turns out, I share a birthday. Mando finds a hotel where previous stays in affiliated chains have earned him discounted rooms. Thanksgiving morning, I meet him in the parking lot. I’m late. We’re in a different time zone, and my watch is an hour behind. We have a day-long drive ahead, but I’m okay. My guardians have made sure I’ll hold up my end despite myself. I’ll be with the Lakota before the rest of the country concludes its commemoration of the Mayflower and Plymouth Rock myths. Hoka hey. Mando and I spend the next ten hours making friends and marveling at a the landscape, rolling hills occasionally dotted with forests and giant rocks or mesas jutting out of the ground dramatically into the sky. By the time we pull into Standing Rock Sioux country, darkness has fallen, and we’ve forgotten all about the black ice.